But that version can't be bought, am I wrong? Or can I buy the "full" version and use the alpha with that license? I don't have any problem with using the alpha version as main player if it fills my needs. Yes, you may buy Unlocker for the full version (585-build is the latest one) and then download Poweramp Alpha over it. All seems to be working very well with the Alpha (Galaxy S7 - not Edge), thank you Max and Andre for all your efforts. Yes, I knew but I forgot to tell here. I already bought the full version and since then I've tried the alpha a couple of times without problems. Thanks! I can confirm that this 586 version fixes the problem for me, on an AndroidOne device, namely the BQ Aquaris 4.5 running Android 6.0.0. I had an intermitent problem with some test files I prepared to check this bug but they're now gone so I think that the album art cache was not completely erased when I tested it. So, for me at least, I consider this bug fixed. And Max, allow me to insist: if you need me to test anything on my phone, just ask. 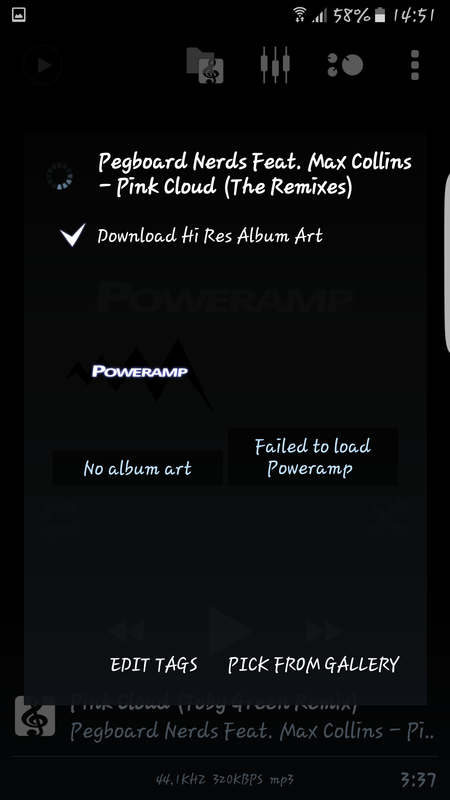 It keeps saying Poweramp failed to load album art. Should be fixed in version 586. Please download build 586 from the Downloads tab here.